Golf Te Puke is just 8km south of Te Puke and is located equidistant from Whakatane, Rotorua and Tauranga - the 3 main metropolitan areas in the Bay of Plenty province. Our Te Puke golf course is in the heart of this beautiful province. Playing at Golf Te Puke is without doubt 'Playing Golf in the Heart of Paradise'. 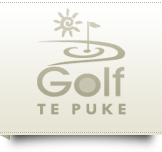 Our Te Puke golf club is situated at the intersection of State Highways 2 and 29. Turn right (if coming from south of Te Puke) or left (if coming from north of Te Puke) down State Highway 29 (‘the Whakatane turnoff’). Our entrance is just past this intersection, on your left. Look for the green rolling landscape - you can’t miss us! The 'Promise fulfilled' is about us doing what we say we will do. This could be from the quality of the course, the golfing experience, products sold in our Te Puke Pro Golf Shop, to simply keeping a promise to anyone who has sought our assistance.